During the summer months I love to sit outside, reading, watching the birds, feeling the summer air - sadly, last night I had to run inside and put on pants. That can only mean one thing, fall is here. As you probably noticed I took the past few months off from writing, almost like a summer break. We had a whirlwind year here at the Alzheimer's Association, so we collectively took the summer to assess where we were, where we wanted to go in the future and what we needed to organize to get there. To say we took the summer off, would not even be close to the truth. Over the past few months we have hosted a huge number of community workshops, hosted a number of new early stage programs (including a super cool partnership with Marshall University Med Students! I <3 students, btw, they are so full of energy and they truly see now problems or challenges only solutions!) Across the state our Walk committees have been hard at work organizing for Walks - that start as soon as next week! One of our most important accomplishments over the summer has been our strategic plan work. Over the past year our entire organization (across the country) worked to develop a new three-year strategic plan, we did so through the lens of a 10-year vision of where we want to be. To say this plan is aggressive, would be an understatement. But, when we came together as West Virginia we were not intimidated - we are energized, focused and determined to not only meet the objectives we set out for ourselves, but exceed them. Why, you might ask? Because we have to. Through our ten-year plan we built a road-map to meeting the current growing need, while also building a strategic path to achieving our vision of a world without Alzheimer's. By increasing our collective drum beat through increasing concern and awareness, advocacy and fundraising we know we will get there. But, you are a big part of our plan. We need your help, now more than ever. From speakers bureau, to Walk organizer, to Longest Day team task force to Board member. If you are committed to a world without Alzheimer's, if you are dedicated to supporting friends, family and neighbors facing the challenges of Alzheimer's and dementia - we need you. Over the next few weeks I will be writing about various parts of our strategic plan, and how we are implementing new and different ideas to achieve our goals here in West Virginia. In the meantime, I would encourage you to check out our nationwide FY15-17 Strategic Plan, by following this link. Together, we can achieve our vision of a world without Alzheimer's. Want to get the inside scoop on what is happening in all things Alzheimer's and Alzheimer's Association? Sign up for our e-news! It is super simple, click this link! A few weeks ago a number of us got together to host a yard sale, which if you know yard sales you have a number of dull moments. During which our awesome Walk volunteer shared a new recipe with me, mostly because she knows my love of hot and spicy. AND easy. AND inexpensive. Tear off a piece of tinfoil - place corn on tinfoil, and smear Siracha Mayo (YES! Siracha mayo, my new found love, now goes on EVERYTHING!) all over cob. When you think it is too much, that is just the right amount. 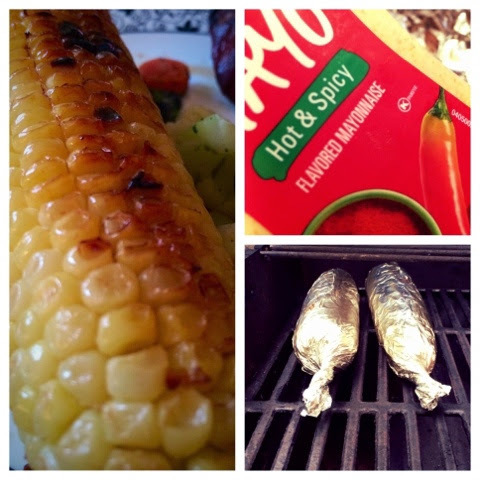 Roll it up and place it on the grill or in the oven. Cook for 15-20 minutes. Unroll and devour! Have water handy, your lips will be tingly!